One of the most puzzling aspects of the Microsoft's Nokia acquisition was the future of the "Nokia" brand. As a part of the deal, Microsoft acquired the "Lumia" and "Asha" brands, but only licensed the "Nokia" brand for feature phone products. 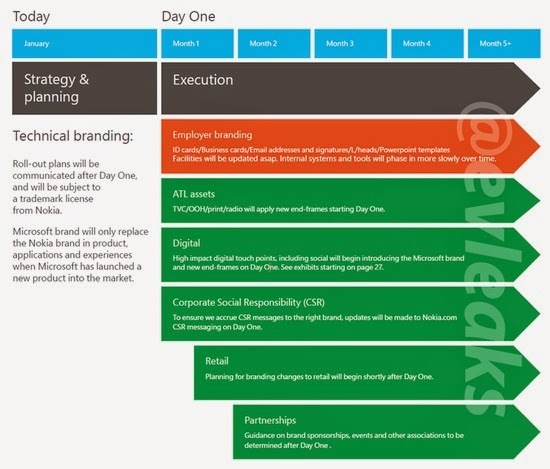 A leaked Microsoft document appears to shed more light on the future of the "Nokia" brand. Microsoft has right to use the Nokia brand for product marketing purposes in connection with devices that carry the Nokia brand (18-months post-close for Nokia Lumia devices; through 31 December 2015 for Nokia X devices; and 10 years for mobile phones). Microsoft brand will only replace the Nokia brand in product, applications and experiences when Microsoft has launched a new product into the market. The Lumia and Asha brands and products, the Mobile Phone portfolio, including Nokia X, sold under the Nokia brand will be transferred to Microsoft as part of the transaction. You may now say, "I work for Microsoft and I work on the Microsoft devices business." Do not say you work on the "Nokia business". Based on my understanding, all Lumia and Nokia X products currently on the market will continue to carry the Nokia brand for some time. However, no new products from either portfolio will carry the Nokia brand. Interestingly, the bulk of Lumia and Nokia X shipments are concentrated in markets where the Nokia brand holds a lot of value (India, Europe, Latin America, etc.). Needless to say, this could spark a steep decline in Windows Phone's market share over the next 12-18 months.